On 1 January 2012, the personnel database of the banking sector consisted of 50.4% men and 49.6% women. This proportion is gradually reaching approaching 50-50. The operational staff is made up of a majority of women (64.82% of the total). However, we are still far from a balance between men and women in higher positions (management and executives): at present the percentage of female executives is 39.72%, the percentage of women with a management position is approaching 25% (23.31%). The average age of employees in the banking sector is between 43 and 44; the average seniority is 18 years. More than 30% (30.14%) of employees in the banking sector are 51 years old or more. The financial institutions also aim to design a policy in which the employment of people with a handicap and people of foreign origin has a central place. Concrete figures for the sector are not available but for the future there is definitely room to recruit more employees from these disadvantaged groups. On 2 July 2007, a Diversity Charter came into force in the financial world. Two key lines are central in the Charter: more diversity and mutual respect on the work floor. The Charter provides for example that the Human Resources departments of the financial institutions must pay attention to the recruitment of persons with a handicap. In 2009 and 2010, together with the trade unions a small-scale pilot project was set up targeting highly educated persons of foreign origin who arrived in this country recently. Other inflow channels than the traditional recruitment agencies were involved to reach these people. Some ten people worked in the financial sector for a year and received additional counselling and training during that time. Eight of them were offered a permanent job at the end of the project. The financial sector aims to offer its employees a healthy working environment. 86% of the sector (16 out of the 19 institutions surveyed) allows its employees to work with flexible working hours. 27.7% of the administrative staff works part-time and 13.4% of the total number of employees uses some form of time credit. 98% of the sector (14 out of the 19 institutions surveyed) offers its employees the possibility of working from home. That number is very high compared to other sectors. Working from home does not just have a positive effect on mobility; it also ensures that employees can better combine their workload with family life. Employees of the financial sector enjoy a series of social benefits, depending on each financial institution’s policy. Examples include: access to healthy food (mainly via the company canteen), the availability of sports facilities at no or at a reduced charge or the possibility to follow programmes to learn to deal better with stress. Some financial institutions also provide international exchange programmes, activities for children during the school holidays or a crèche. In addition to the 20 mandatory days of leave and the 10 mandatory public holidays, the financial sector offers a number of additional days of leave. Many financial institutions encourage their employees to change positions every 5 to 7 years In order to try to keep the motivation of their employees up and their productivity intact. In the collective labour agreements (CLAs) of the banking sector, the aim is to achieve an HR policy in which broad deployability of the employees during their entire careers has a central place. The CLAs also provide that the employees who change positions are given guidance. Training is a constant point for attention for the financial sector. The figures show that the number of training days hardly decreases as staff ages. The most recent figures of the National Bank of Belgium (from 2010) indicate that the financial sector spends 2.75% of the total of gross salaries on training. The average for Belgian companies is 1.64%. The target described in the Generation Pact is 1.9%. 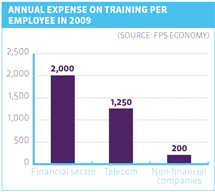 Per employee the financial sector spends €2,000 on average on training annually. In the other sectors that amount is far below €500. Due to the crisis, training courses are made available in a more selective manner. For instance, more internal training courses are given, and the courses given by external parties are limited. In addition, new methods are more often used, such as e-learning, to reduce cost and nevertheless have the possibility to offer training. Despite the efforts of the financial institutions to offer their employees healthy working conditions, we cannot deny the workload. Reaching targets and sales figures, the restructuring and soft dismissals of the last few years, etc., many employees have to cope with additional pressure in the working environment. In addition, work security is no longer a given in the financial sector. Whoever wants to build a career has to work hard. The financial sector is also particularly complex. For the outside world this creates an impression of incomprehensibility, a sector of grey suits with a rigid image. On the other hand, this may be a stimulus for young talent who see this complexity as an intellectual challenge. Nevertheless, in the last few months it has proven to be increasingly difficult for the financial sector to attract and hold on to young people. This is also reflected in the extent to which young people consider the financial institutions to be attractive employers. In the last three years, not a single financial institution has reached the top 20 of the Award for Most Attractive Employer of the Randstad temping agency. In 2009, KBC, ING and Dexia still appeared on the list. Which are the companies that do appear in the top 20? In 2012, the highest places were dredging company Deme, pharmaceutical giant GSK and technology giant Techspace Aero. The fact that the Belgian banks have limited their international activities or that they were taken over by a foreign concern has reduced the opportunities of their employees for an international career. This may be why the sector has lost part of its attractiveness for young talent. The stern image does not help either. A good basic salary no longer suffices for the youngest generation of employees. A good work-private life balance is increasingly central in their search for the ideal job. If the sector wishes to attract and hold on to talented youngsters, it has every interest therefore to keep work pressure bearable and to provide flexibility. Which salary for a new financial sector employee?